Linde Material Handling (UK) Ltd has opened a new depot in Wellingborough to strengthen its local network and better serve its customers in the region. 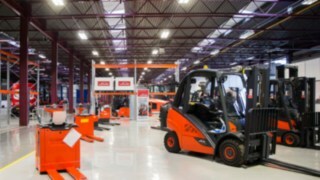 Linde has moved into a 53,000 square feet site in Wellingborough, from which it will sell both new and used forklift trucks, offer short term rentals and provide service support to local customers. The premises has office and warehouse space which also includes an engineer training centre, a customer area with demonstration facilities and meeting room space. There is also be an area dedicated to preparing Linde approved trucks for customers by its network of trained engineers. The depot is the base for more than 50 Linde employees among sales and service personnel, ensuring even shorter response times to our customers in the area. The new depot, is aimed at strengthening Linde’s local network to meet increased customer demand, reinforcing the company’s strategy on local proximity and density. The site officially opened at a launch event on March 28, which was attended by the mayor of Wellingborough, councillor Paul Bell, and senior employees of Linde. Max Sammartano, Linde Material Handling UK managing director, said: “This is an important step reinforcing Linde’s growth plan as we are aiming to follow market trends closely and anticipate customer needs. “Wellingborough is an ideal location for us as its rapidly expanding industrial and warehousing sectors mean we’re close to our customers and suppliers. “Our aim is to understand and meet our customers’ needs, and this new premise will help us achieve that, allowing us to better serve our customers in the central England region.